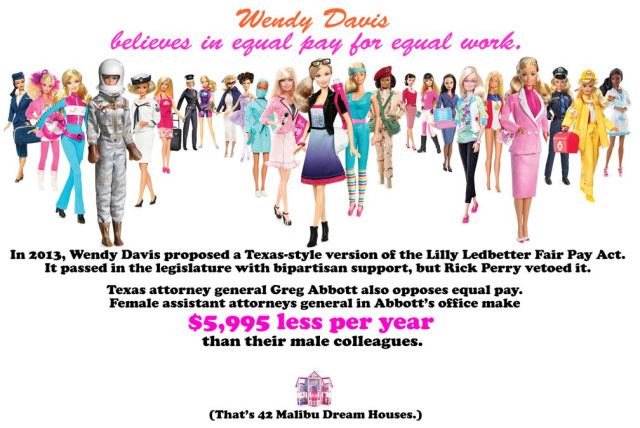 You’ll be shocked to discover I have feelings about Attorney General Greg Abbott’s attempts to use “Abortion Barbie” as a slur against Wendy Davis in his campaign for Texas governor. Not only does that insult the 33% of women who have had an abortion (myself included), but it’s an insult to Barbie. However you feel about Barbie the doll, you have to give credit where it’s due. Over the years, Barbie has stepped into every field imaginable. Were she real, she would certainly have felt the effects of the GOP’s continual obstruction of equal pay laws. So, in response to Abbott’s sexist slander of Wendy Davis — all of which occurs as he attempts to dodge having to debate her publicly — I give you my friend Andrea Greer’s spectacular rebuttal. Greg Abbott and his surrogates surprised no one when they sunk to new lows with the whole Abortion Barbie campaign. They forgot, however, that Barbie’s got a voice and mind of her own. She’s not just a bathing beauty. She’s a working woman, and working women understand that if you do equal work, you should get equal pay. Barbie is everywhere. She’s gone into space, she’s practiced law and medicine, she’s made it big on the athletic field and in broadcast journalism. She’s made friends, bought a house or two, volunteered for service in the military … if a person can do it, Barbie’s done it. And Barbie’s pissed, because in Texas, Greg Abbott and the Republican Party are determined to make it harder for her to live her life just because she’s a woman.